for the Lord is your security. A squirrel comes by every now and then. One morning he turned up his nose at the dried corncobs I put out just for him and risked his life checking out the bird feeder, only to find thistle seed. So he jumped back to the deck and began searching for acorns. Unfortunately for him, we had fewer that year. We didn’t want any acorns to sprout in the yard or attract the woodpecker who wanted to drill holes and store them in our walls. So I hired one of our grandsons to pick up acorns and paid a penny each. One sand bucket carries two hundred. He filled five and felt like a millionaire. 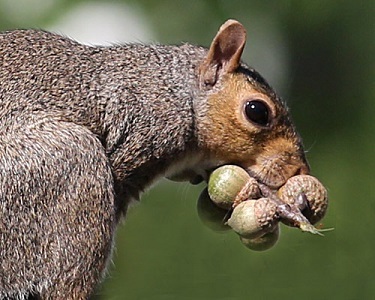 Squirrels have a ceaseless need to keep gathering and storing food. On a visit to Oregon Caves, a ranger told us about the tons of acorns squirrels had stored in the caves – all of which had to be removed. The squirrels had turned cave rooms into warehouses, leaving little room for exploration. That number of acorns was far beyond what the squirrels could possibly need. But no matter how much they gathered, it never seemed to be enough. How many of us are that way, incessantly storing for a rainy day? It’s not nuts to prepare for the future, but if we think security comes from what we have in the bank, the cupboards, the closet, or the investment portfolio, we’ll end up worse than disappointed. Our security is in the living God. He is our refuge and our strength, as Psalm 46 says, so we don’t need to be afraid – even when our circumstances look dire. We can even state boldly, with the psalmist, “Let the oceans roar and foam. Let the mountains tremble as the waters surge!” (v. 46:3). No trouble on Earth – loss of a job, outbreak of war, illness in the family, persecution – can change the fact that the Lord reigns over all creation. He is sovereign. Life may not work out exactly the way we think it should, and we may have to face the fact that we are not in control. But the even better truth is that God is. When the hard times come, remember that God made you, he loves you, he has a plan for your life, and he is preparing a future beyond your wildest expectations. Where do you find your security? In your abilities? Your savings? Your plans? Your job? What could be the benefits of fully trusting in God instead of relying on yourself? What’s one area of your life where you are still trying to maintain control? Tell a friend about your struggle. He or she probably has struggles, too. Share with one another how you each can release your cares to God and trust in his sovereignty. Lord God, you are my rock and my refuge. Why do I need to be afraid for the future? It is all in your hands. Help me to trust you and to believe that you will do what is best. You alone are my security.